It wasn’t that long ago that Squirrel Queen proved her legion was taking over the planet by making the screen cap above. 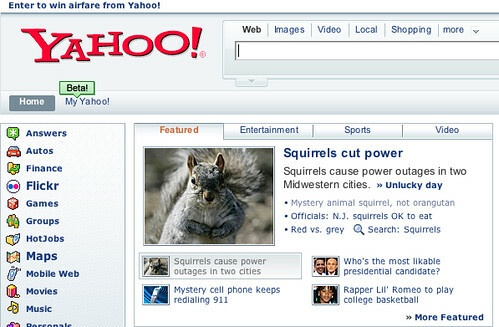 Squirrels dominated the news on Yahoo. Today PopFi is having a squirrel fest. The fun site (yes, I know some folks who post over there, just to be fair) has a story about a robot squirrel and a pic of an acorn lover getting a big wet french kiss from a giraffe. First the Innertubes and then the world.